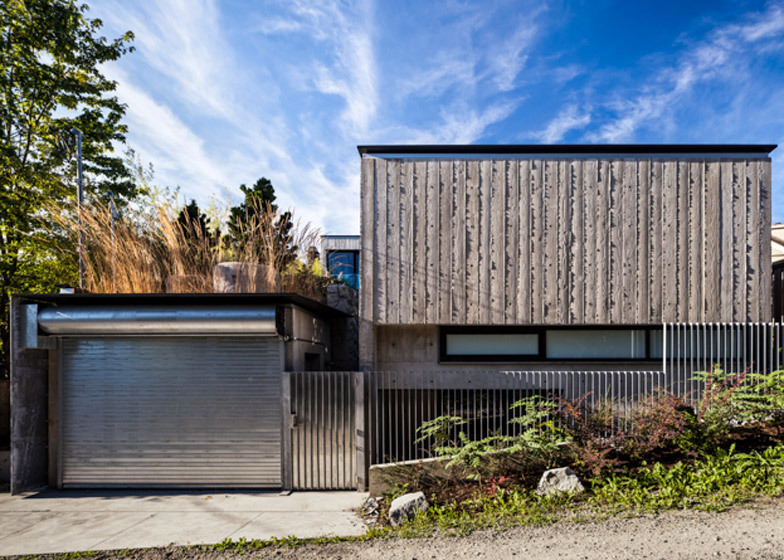 Measured Architecture has completed a family residence in Vancouver that features an exterior made from blackened steel and wood-marked concrete (+ slideshow). 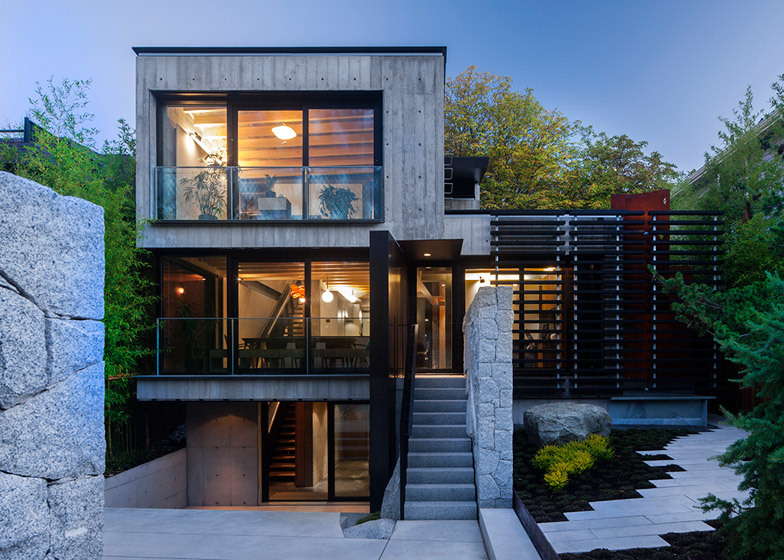 Encompassing 223 square metres, the three-storey house sits on a hilltop in central Vancouver, offering views of the nearby mountains and ocean. Built for a grandmother and her grandchildren, the project also entailed construction of a 56‑square-metre guest house behind the main dwelling. 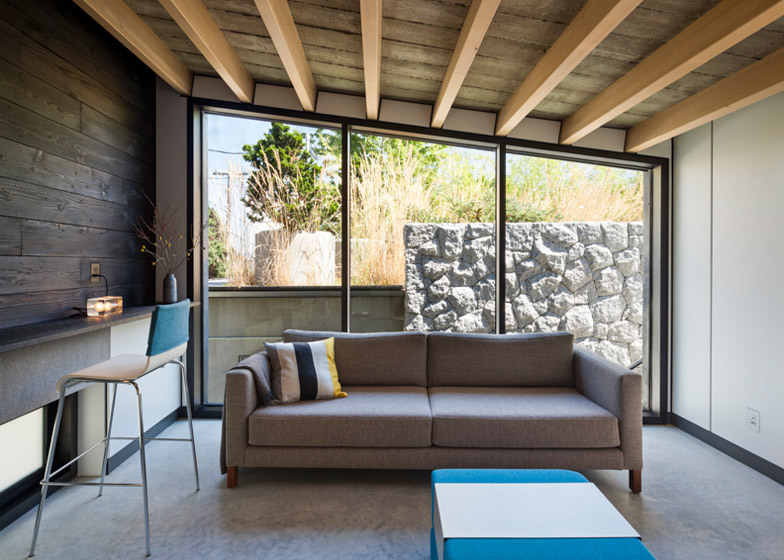 "At its root, the Cloister House is a quiet refuge, a state of seclusion within the city, shared between a grandmother and her grandchildren," said Measured Architecture, a Vancouver-based firm. "The overall design unites seemingly contrary characteristics: deliberate darkness, industrial materiality, organic landscape and playfulness." The home was built on the site of a rundown bungalow dating to the 1940s. The structure was razed, but the firm saved more than 90 per cent of the building material. "Rather than demolishing the existing house in the traditional manner, Measured participated in a pilot project with City of Vancouver and Pacific Community Resources to sustainably deconstruct the building for salvage, recycling and reuse," said the firm. "The process imparted a positive tone and spirit to the project, which were consequently influential in the fabrication of the new house," said the firm. Composed of stacked boxes, the main house has a facade consisting of blackened steel and concrete panels that retain markings from the charred wooden boards used to set them. "The charred planks left a rustic, high-relief surface on the concrete that matured over successive pours," the firm explained. 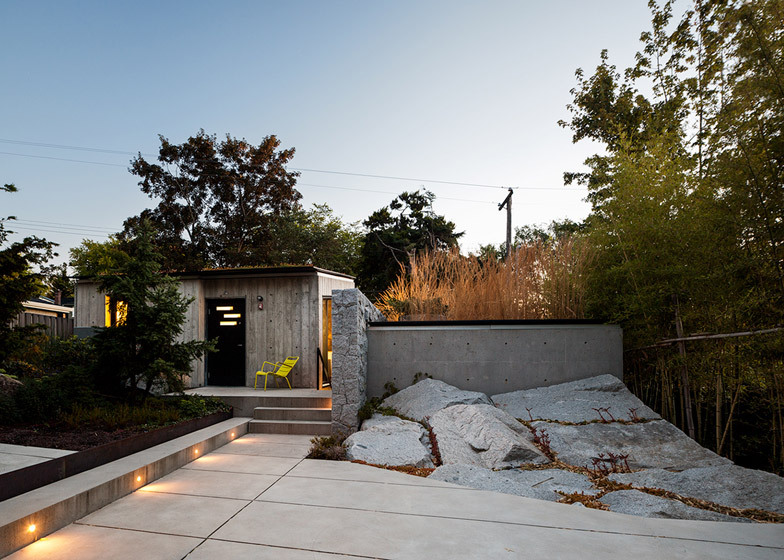 Determined to recycle materials wherever possible, the firm used leftover concrete from each pour to make stepping stones for the home's backyard, and used planks from the concrete formwork for soffit panels and interior walls. A spine wall made of concrete and granite anchors the plan of the house, stretching from the front sidewalk to the rear of the property, with a short break between the main dwelling and guest house. 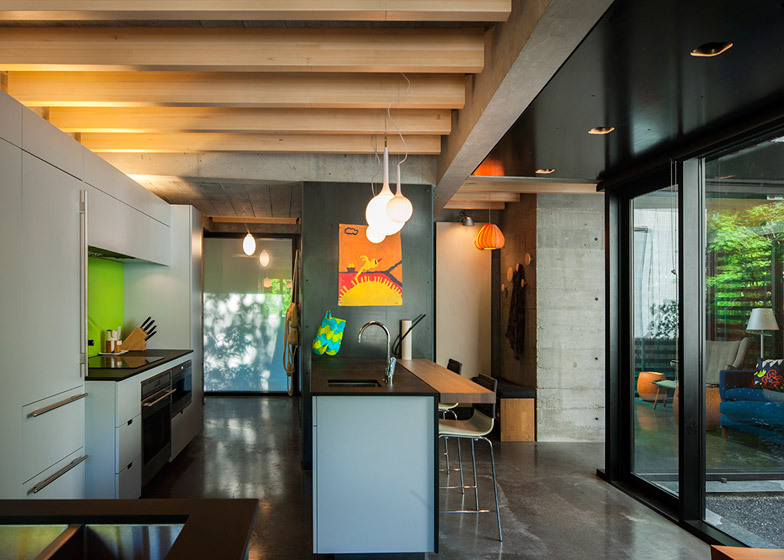 The home's interior features concrete walls partially covered in Venetian plaster panels to conceal servicing equipment. Ceiling beams are made of yellow cedar. "The material choice also enables a hyper-clean environment, essential for the client's asthma," said the firm. "For this reason there is not an inch of drywall in the entire project." The architect incorporated "whimsical, kid-friendly elements," such as a steel slide that runs alongside an internal staircase. The slide's design was inspired by a chute on a concrete mixer. 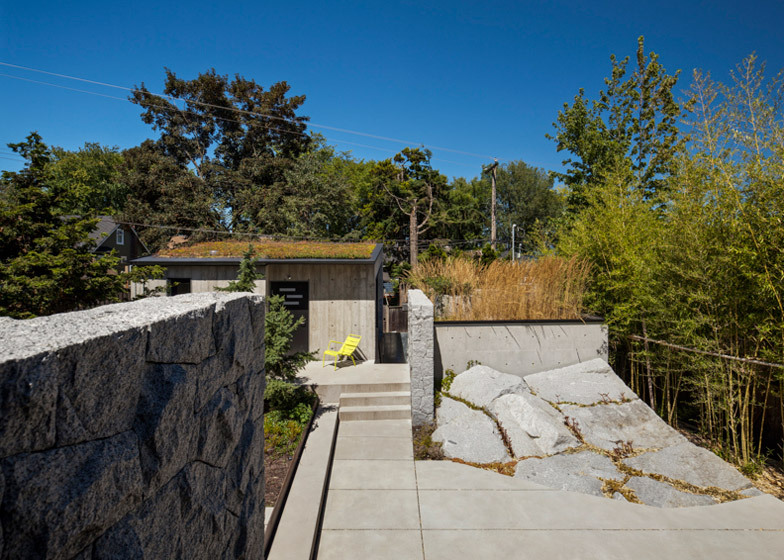 The guest house, referred to as the Laneway House, contains a bedroom, a small garage and a green roof. A portion of the dwelling sits below ground. "With the sleeping quarters subterranean, the building is carefully carved into the sloping site to complete the cloister feel of the project as a whole," said the firm. The main dwelling was built first, with leftover materials such as charred lumber used for the guest house. The property features an intimate pocket garden with a weathering-steel wall sculpture by local artist Fei Disbrow. The artwork provides privacy while also enabling softened daylight to stream into the space. The firm also incorporated an "undulating boulder landscape" between the main dwelling and guest house. Working with Japanese master stone mason Tamatsu Tongu, the architects selected stones from a local quarry and carefully assembled them on site. Measured Architecture was founded in 2007 by Clinton Cuddington. Other recent projects in Vancouver include a cedar-clad house by Splyce Design and a timber-lined studio by Scott & Scott Architects. Photography is by Nic Lehoux, unless stated otherwise.